The File Assistant add-in for Microsoft Excel keeps track of the last 200 files you opened! It is compatible with Microsoft Excel 2007 to 2019 and Office 365. If you select just a single file then you can either open it or go to its directory by clicking the Go To button. If the check box for using the Windows Explorer is clicked then the Windows Explorer is opened to the selected file's directory. 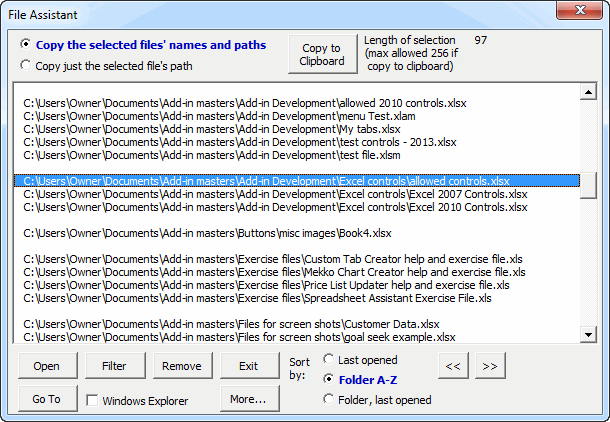 If it is not checked then Excel's File Open dialog is displayed with the current directory being the selected file's directory. You can sort the list of files by clicking on the any of the three sort by buttons. You can sort the files many different ways. The Filter button allows you to display just the files containing specific text. This allows you to reduce the visible files if you are searching for a particular file. The Remove button allows you to remove files from the list that you no longer wish to be on the list. The files are not deleted or erased. If you open the files again they are added back to the list. Click the Copy to Clipboard button. This copies the paths and file names of the selected files to the clipboard. When you press enter the files are attached! Simple, easy, and a lot faster than searching through drives and folders and files! If you have many files to e-mail then you can copy just the path of a file to the clipboard and paste into your e-mail program's file attachment dialog. To do this select a single file and click the second option button which indicates that you wish to copy just the file's path. Then when you press enter, the file's folder is displayed making it easy to select files from that folder.